As part of an eight-day fellowship program by the Asia New Zealand Foundation of New Zealand, Ms. Carmen Parahi, a senior reporter at NZ television production company Pango, visited Japan from February 1 to 8. She traveled to Tokyo, Chiba, Saitama, and Oita, covering themes including the 2019 Rugby World Cup, coastal whaling, and creating food brands. The FPCJ helped arrange the details of her program at the request of the Asia New Zealand Foundation. Her week-long stay started with visiting the Japan Rugby Football Union in Tokyo, to hear about efforts to further improve Japanese players’ performance before the 2019 Rugby World Cup in Japan. 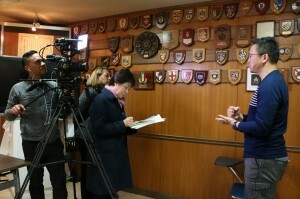 In Saitama, she interviewed a New Zealand native who teaches both rugby and English at a high school. Ms. Parahi also interviewed Japan’s Commissioner to the IWC Mr. Joji Morishita as part of her coverage of Japanese whaling culture and government policies. Ms. Parahi then spent two days in Oita, speaking with Oita Prefecture New Zealand Friendship Association Chairman Kenji Nishi about Beppu’s attractions and its history of exchange with Rotorua, since Beppu City is sister cities with Rotorua in NZ. She also spoke with Beppu City Vice Mayor Shinsuke Inomata about initiatives to encourage national teams such as New Zealand’s All Blacks to come to Beppu to hold training camps. On the second day, she participated in the Oita press tour sponsored by Oita Prefecture and planned by the FPCJ, reporting on efforts to develop food brands in the prefecture. In Minamiboso, Chiba, Ms. Parahi covered the theme of whaling, which is also part of the traditional culture of the Maori in New Zealand. In addition to interviewing local residents about coastal whaling and whale as part of food culture, she visited a local museum and a food processing plant that handles whale meat. Finally, she visited a local elementary school and spoke with Grade 5 students who had been learning about coastal whaling.